Numerous definitions of man have been sup­plied by eminent writ­ers, distinguishing him by habits peculiar to himself from all other species of the animal kingdom. One author has defined him as "a cooking animal," another as "a spit­ting animal," and a third as "a laugh­ing animal.” We propose to add to the list of definitions by calling him "a gambling animal." The propensity to gamble has pre­vailed in all known ages of the world and in all known races of mankind, and it is a curious fact that it owes its origin, at least in Europe and Asia, to religious ceremonies, derived from a faith in divine indications which left the decision of important matters to chance, fortuitous results being re­garded in ancient times as the expres­sion of the will of the deity. In the archaic records of Asiatic monarchies; in the biblical annals of the Hebrew theocracy; in the Homeric accounts of events that occurred at the siege of Troy; and in the history of ancient Rome we find the same prevailing practice of invoking an appeal to the deity by casting lots and by other such moves of learning his will. By lot nine and a half tribes of Israel obtained their respective posses­sions in the land of Canaan; by lot Nebuchadnezzar decided whether he should first attack Rabbath, the city of the Ammonites, or Jerusalem; and by lot Christ's garments were divided among the Roman soldiers. The chance number of a flight of birds decided the question as to who was to be the founder of Rome, and the ancient augurs ob­tained their divinations from instruc­tions derived from the dictates of chance. The mightiest monarchs of antiquity had recourse to this method of decision for the guidance of their action, and the vicissitudes of a na­tion's existence not infrequently de­pended upon the controlling influence exercised by it over the movements of great military leaders. The element of chance being thus constituted the arbiter in all important questions in the management of relig­ious, civil and military affairs on all occasions of uncertainty during the lapse of ages, this solemn mode of appealing to the deity was gradually extended in scope and finally degen­erated into gambling. The religious element, however, long kept its grasp on the mind, and the ancient gambler would mutter a prayer as he shook the dice-box. In process of time the habit became general and a religious ceremony became the parent of a wide-prevailing vice, pregnant with evil. The Roman legislators at an early date recognized the pernicious effect of gambling, and it was prohib­ited by law both during the Republic and during the Emperors. This brief outline of the origin of gaming is suf­ficient to explain the reason of its widely prevailing existence. Although the love of gambling was thus implanted in most races of mankind, the curse it entails by unlimited indulgence in it is so pestilential that in all civilized communities it has been curbed and kept within bounds by legislation. Chinese civilization, however, has not yet arrived at that stage of advancement, and gam­bling in China is a veritable epi­demic. It is true that the Government long ago made an effort to suppress it, but so universal is the vice that laws and enactments proved ineffective, and the legislators fell back upon the profitable compromise of issuing licenses to keepers of gambling establishments. All that was accom­plished by this policy was an increase of revenue; it had little or no effect in limiting the evil, for so far as the prohibitory sections of the gambling laws go, discriminating in favor of the licensed hells, they may be regarded as dead letters. After the Chinese began to arrive on this coast it was not long before the professional gambler made his appearance, and as their numbers in­creased, Chinatown in this city be­came a nest for gambling dens and lottery companies. Prone as man is to evil, the haunts naturally allured numbers of the white population of San Francisco, the lotteries especially being a very loadstone of attraction. Clerks and employees spent their earnings in tickets, the youth of the city began to be corrupted with the deleterious leaven, and even women gambled extensively in the Chinese lotteries. What increased the temp­tation and consequent ruinous effect of these institutions was the frequency of the drawings and the enormous possible prizes. Every-day drawings took place in half a dozen different back rooms in the rear of shops open­ing on to the streets; and as it was pos­sible to gain in a few hours from two hundred to four thousand dollars on a dollar stake, the inducement was overpowering. There was no waiting anxiously for weeks for the issuance of the prize list; you could stake your money in the morning and know what your luck had been in the after­noon. 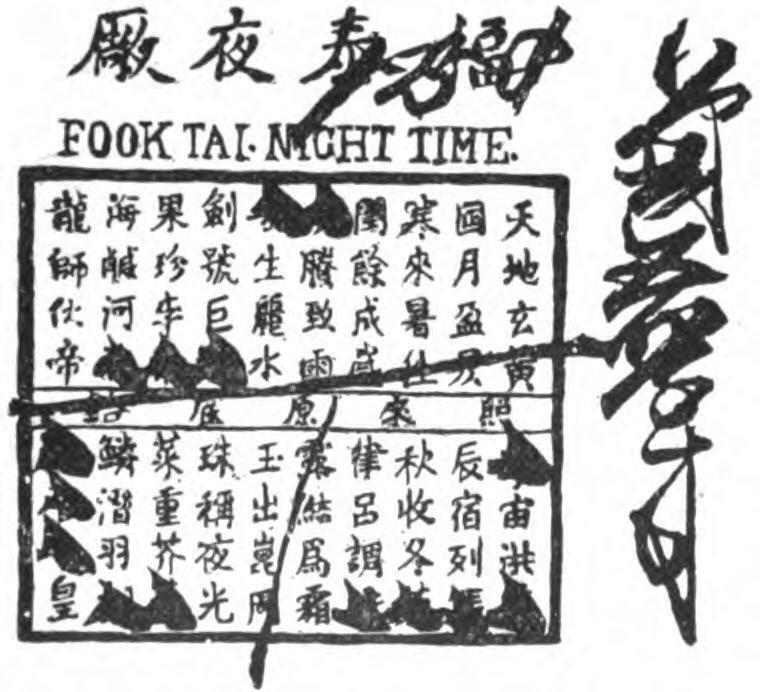 This diurnal drawing places Chinese lotteries almost in the same class of gambling games as faro, rouge et noir, etc. It only takes a little longer time for the player to drop his capital or make a coup. Another reason for the patronage extended by white gamblers to the Chinese lottery companies was the in­variable punctuality with which pay­ment was made upon winning tickets no matter how large the amount. Moreover, the system precluded the possibility of forged tickets being passed upon a player, it being quite different to that on which the lotteries of white races are conducted, which admit of rascals disposing of fraudu­lent imitations of the genuine tickets to purchasers. These several induce­ments to uninterrupted gambling led to the invariable result. Cases of defaulting employees occurred, and around homes that otherwise would have been prosperous and happy, the specters of poverty and want hovered. Wives gambled unknown to their husbands, and husbands failed to bring home with punctuality their weekly earnings. Had it not been for the vigorous action of the police, the evil would have assumed gi­gantic dimensions and reduced to misery a large portion of the working population. But a vigorous war was waged against the Chinese gambling institutions, and though it seems im­possible to suppress the vice entirely, it has at the present time been reduced to a minimum. At these gambling dens the one great game that is played is Fan Tan, or the Tan game as it is called by the whites. What rouge et noir is in the salons at Monte Carlo and Monaco, such is fan tan in the Chinese halls. The following is the mode of play. It is really a simple matter, consist­ing in backing one number out of four, but the way in which the game is managed seems to preclude all pos­sibility of cheating, and the player seated at the fan tan table has only to contend with luck, which gives him a better chance than the professional faro dealer allows him. 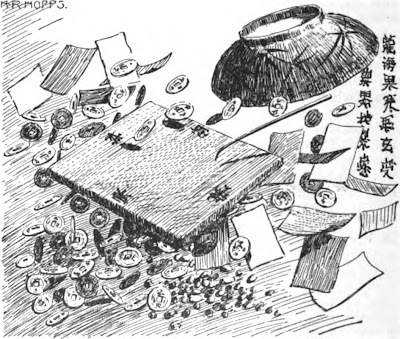 The para­phernalia of this favorite game of the Chinese consists of a square slab of metal, generally pewter; a heap of Chinese cash; a cup or small bowl; a money tray, a packet of cards or narrow slips of different colored card­board, and an implement which we will call a chopstick. On the sides of the metal slab which is about a foot square, and for which paste-board is often substituted, are marked the numbers 1, 2, 3, and 4. One of these numbers the player hacks to win against the other three, plac­ing his stake on the side of his nu­merical choice. The banker having taken his seat, with his money tray before him, on one side of the table and opposite the square slab, which is placed in the center, his confederate, or partner, seats himself at one end of the ends of the table with the heap of cash or some substitute therefor, in front of him, the players standing or sitting around. Before the stakes are put up, the confederate takes from the heap of cash before him a large handful of the tokens or counters and without count­ing them places them under the cup; when all the bets are made he lifts this up and proceeds to count them off by four at a time with the chopstick. The number left at last decides the winning number of the fan tan slab. Thus if one count is left over, No. 1 wins; if two, No. 2; if three, No 3; and if four remains at last, No. 4 wins. The betters on the winning number receive three times their stake less a certain percentage de­ducted in favor of the banker. So far as gambling games go the man­agement of it is perfectly fair, the counter of the tokens not being allowed to touch them with his fin­gers, each bunch of four being separated from the heap by the chopstick. The proceeds, however, derived from the losers' and the percentage deducted from the winners' gains make fan tan a profitable game for the banker. When a large number are engaged in the game, each receives one of the colored slips of card-board on which he places his stake, thus enabling the banker to distinguish the betters, and prevent disputes and attempts at mis­appropriation. The Chinese system of lottery is unique, and there are some interesting particulars with regard to the name and the ticket used. By reference to the illustrations the reader will per­ceive that the tickets bear eighty Chinese characters, no two of which are alike. These characters are the re­print of ten lines of a celebrated Chinese poem, each line consisting of eight words. See Tsz King is the name of the poem which is a marvel­ous production. It consists of one thousand lines in which no word is ever repeated. There is no other book of the kind in China, and it would not be rash to assert that no other such could be found in the world. To weave eight thousand words into a poem is an achievement which only the Chinese language admits of a poet performing. Another curious thing is the origin of the Chinese name for lottery which is pak op pen, meaning pigeon document. In very ancient times the practice of employing carrier-pigeons as postmen prevailed in China. The message was written on a slip of paper of the finest tissue, and the letter, being then rolled tightly up, inserted into the quill of one of the bird's pinion feathers which was carefully opened for its reception. A note thus con­veyed by a pigeon was called pak op pen; pak op meaning pigeon, and pen, document. 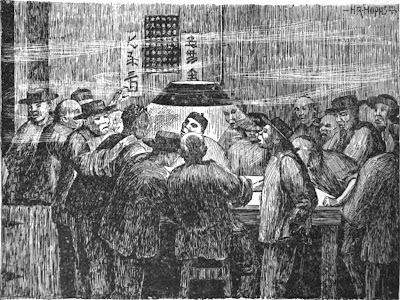 In the earliest at­tempts on the part of the Chinese Government to suppress gambling in lottery ventures, an infractor of the law promulgated with that object, on being arrested, swore in court that the tickets produced in evidence against him were only " pigeon doc­uments, " and from that incident the lottery game derived its present name. Let us now see how the Chinese lot­tery is conducted. As before mentioned the tickets contain eighty different characters. A sufficient number of them are printed off for each drawing, possibly for several drawings, all of which are exactly similar. The player having found his way into the office of the lottery keeper, having taken due cau­tion to avoid the observation of the watchful police, he is provided with a ticket on which he is allowed to mark off ten of the characters after having deposited his stake, the lottery keeper taking a duplicate of the same. The characters thus marked are designated as spots. At the drawing the keeper of the lottery marks off on one-of the tickets, by a process that will be after­ward explained, twenty such spots. When the lottery is closed, if five spots of the player's ticket correspond with five of the lottery keeper's tickets, he wins the amount of his stake; if none, or less than five, correspond he loses. If, however, six of his spots correspond with six of the banker's he wins ten times his stake. Seven corresponding spots gain for him two hundred times his stake; and eight, nine and ten corresponding spots secure for him respectively, one thou­sand, two thousand and four thousand times the amount of his put-up. Though, of course, the chances against the player of winning even the amount of money which he stakes are enormous, their true negative value is a hidden quantity to the uncalcu­lating public, while the seductive at­traction of the large sums that may be won with luck, is irresistible to a large number of people. Were it not for the activity of the police in ferret­ing out the secret quarters of these lottery men, a very considerable por­tion of the working and other classes of San Francisco would be involved in ruin and reduced to abject poverty. The way in which the lottery dealer marks off the twenty spots on the ticket which regulates the win­nings is as follows: He cuts out all the eighty characters of one of the tickets and rolls them up into little balls or pellets. These are well mixed up in a cup and then twenty of them are drawn out and laid aside; the heap is then mixed up again and another twenty withdrawn, the remaining forty being mixed up and divided. The keeper of the lottery has thus four heaps of characters, twenty in each. Each of these heaps is in turn well mixed up and five of the little balls are withdrawn from it, so that there are twenty in all when the drawing is finished. The characters which these twenty pellets bear are those which are marked off on the lottery man's ticket and constitute the game. When the player returns after this ticket is issued, the hour of which he is informed of, it is shown to him and he compares the spots on his own ticket with those which it bears. It is well known that rich Chinamen are at the back of these lotteries, and there is never any doubt as to the payment of prizes. The heathen Chinee is peculiar." Owing to the frequent raids made by the police authorities on the Chinese gambling dens, it is difficult to obtain information from the Mon­golians themselves; it was only through the courtesy of Detective Cox, who obligingly rendered the writer every assistance in his power, that the above details were obtained and a photograph of a fan tan game secured. Since the Supreme Court of the United States declared the Geary Act constitutional the Chinese have drawn themselves into their shells, are reticent to the last degree, and close their doors to the photographer. They are particularly careful to avoid exposing their countenances to the camera, as will be observed in the illustration; sun-pictures of China­men and their surrounding are now obtained with difficulty. Comparatively few white gamblers frequent, or ever did frequent, the fan tan gambling dens. To take part in that game requires the players con­tinued presence at the table for some length of time, and the danger of a visit from the police deters men from indulging in a legal proceeding which necessitates a lengthened stay. In visiting the lottery places less risk is run. A few minutes are all that are required to enable the player to pro­cure his ticket, pay his coin, and mark off the spot, and still fewer to learn what his luck has been when the drawing has been made. More­over, the lotteries attract a large number of people who cannot afford the time to play long games—clerks and employees of every class, mechan­ics and workmen, who are occupied in their respective vocations during the day. Thus it is that the Chinese lotteries have always drawn more victims into their meshes than fan tan. I must thank you for posting this blog because the topic is very much in demand today and everyone wants to read about it. Play online slot games from online bingo uk who is the best place for players to play online bingo slot games.